Romesco Sauce goes well with pan fried fish, chicken, roast lamb or beef, or in sandwiches, as a change from mustard or mayonnaise. It’s quick and easy to make, keeps in the fridge for up to a week and can be frozen. Here I served it with pan-fried barramundi fillets, cooked until the skin was nice and crispy and mashed sweet potatoes. A delicious flavour combination. Sauce: Place all ingredients except oil, salt and pepper in food processor and process briefly until chopped. Scrape down the sides then with the motor running slowly add the oil and process till chunky-smooth. Season to taste. Peel sweet potato, cut into chunks, place in a saucepan with some salt. Cover with boiling water then simmer for 15 mins or until tender. Drain and mash with butter and salt and pepper to taste. Place olive oil in a non-stick medium sized frying pan. Pat fish fillets dry with paper towel and season with salt and pepper. Place fish in the cold frying pan, skin side down, then turn on the heat and cook for 4 mins or until skin is crispy. Turn fish over and cook for 2-3 mins on the other side or until cooked through. 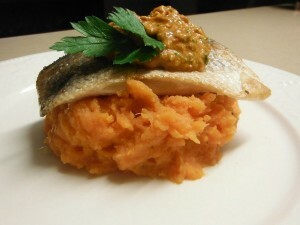 Serve fish on a bed of mashed sweet potatoes, topped with a dollop of Romesco sauce and garnished with parsley. Keep any leftover sauce in a covered container in the fridge for up to a week. We eat salmon fillets about once a week. It’s quick and easy and we love it. Sometimes I spread the fish with a mixture of grated fresh ginger and Thai sweet chilli sauce and bake it in a very hot oven on lightly oiled aluminium foil for about 8 minutes. Other times I pan fry or bake the seasoned salmon and serve it with this sauce, adapted from a recipe by French chef Michel Roux. It’s really just a thick herby, tomatoey vinaigrette. In 1967 Roux opened Le Gavroche in London with his brother Albert. The restaurant became the first in England to win three Michelin stars. In 1972 they opened The Waterside Inn, which went on to become the first restaurant outside France to hold three Michelin stars for over 25 years and is now run by Michel’s son Alain. This sauce is great to have in the fridge because it goes with all sorts of things and keeps for at least a week. In fact I think it improves after a day or so. It goes well with roast chicken or steak and is absolutely delicious served in half an avocado. 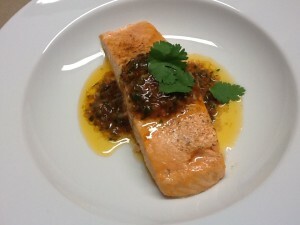 The original version uses tarragon which definitely gives the sauce a distinctive flavour. 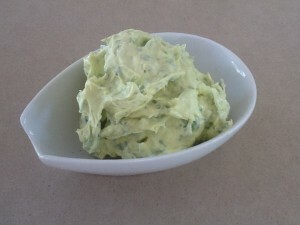 But fresh tarragon is not always available, so vary the recipe with different herbs and see what you like best. Place chopped onion or shallots in a pan with water, bring to the boil, then drain thoroughly. Place herbs and onion in food processor and chop finely. Scrape into a jar with a lid, add remaining ingredients and shake well to combine. Serve at room temperature on grilled or pan-fried salmon, roast chicken or steak. Keeps in the fridge for up to a week. Note: the original recipe used chervil, chives and tarragon. In the photo I used dill, parsley and coriander. Use whatever you have available. As I made a batch of garlic butter to have in the fridge over the holiday season I thought to myself that it’s one of those recipes which has become “retro”. Popular in the seventies and eighties, we used it in garlic bread, on steaks and grilled fish and in Chicken Kiev. But then it went out of favour, along with prawn cocktail, beef bourgignon, steak Diane and all the other dishes we enjoyed before gastronomy took off. Suddenly these recipes weren’t posh enough. Whenever I serve garlic bread to a crowd – fresh from the oven and oozing home-made garlic butter – it always disappears. And a dollop of garlic butter on a freshly barbecued steak, piece of fish or succulent prawn is delicious. So here’s the recipe. Oh and it’s probably a good idea to label the container so the kids don’t ask why the butter’s gone green! Place herbs in food processor and process till finely chopped, stopping to scrape down the sides halfway through. Add garlic, butter and salt and process till mixed. Return to the plastic butter container and refrigerate. Keeps for 2-3 weeks in the fridge, but much longer in the freezer. Just thaw long enough to use what you need then put back. Garlic Bread: make diagonal cuts in a French baguette, not quite through to the bottom. Spread each slice with garlic butter. Wrap the loaf in foil and refrigerate or freeze till needed. Thaw if frozen then bake in a hot oven for about 15 minutes. Serve hot. 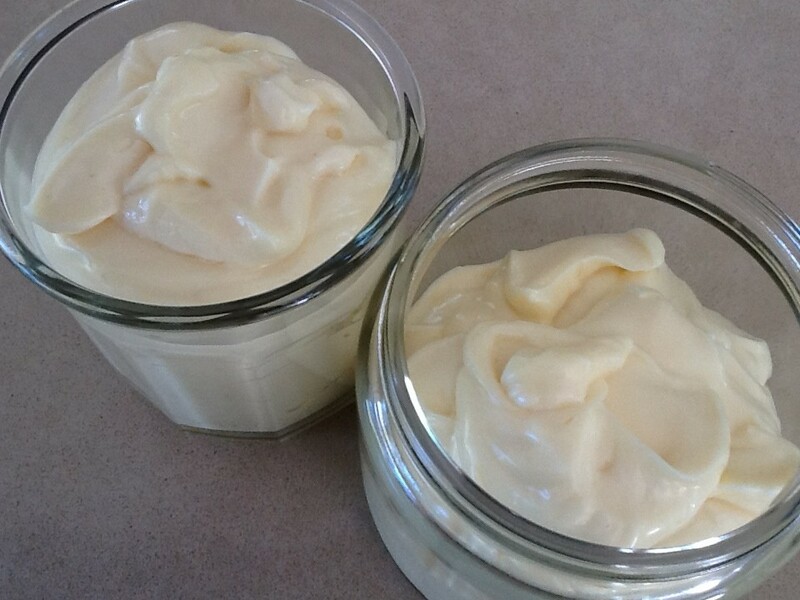 Home-made mayonnaise is delicious and you can whip up a batch in less time than it takes to go to the corner shop and buy some. Some recipes use egg yolks, but I prefer this lighter version using whole eggs – unless I happen to have some egg yolks left over from another recipe which need using up. Instead of two whole eggs you can use four egg yolks, or one egg and two yolks. Using more yolks makes the mayonnaise more yellow. From the basic recipe it’s easy to make tartare sauce to serve with fish or a pink dressing known as Salsa Golf in Spanish, to serve with seafood. It’s important to “warm” the ingredients by mixing for a minute or so before adding the oil, to stop the mixture from curdling. Despite taking this precaution, occasionally you may find yourself with a batch of curdled mayonnaise. Maybe it’s caused by the freshness of the eggs or the weather, who knows. To solve this dilemma start over again and make a fresh batch – maybe half the recipe if you don’t want to end up with too much! Once that’s made, gradually add the curdled batch to the good batch through the chute of the food processor, with the machine running. This usually does the trick. 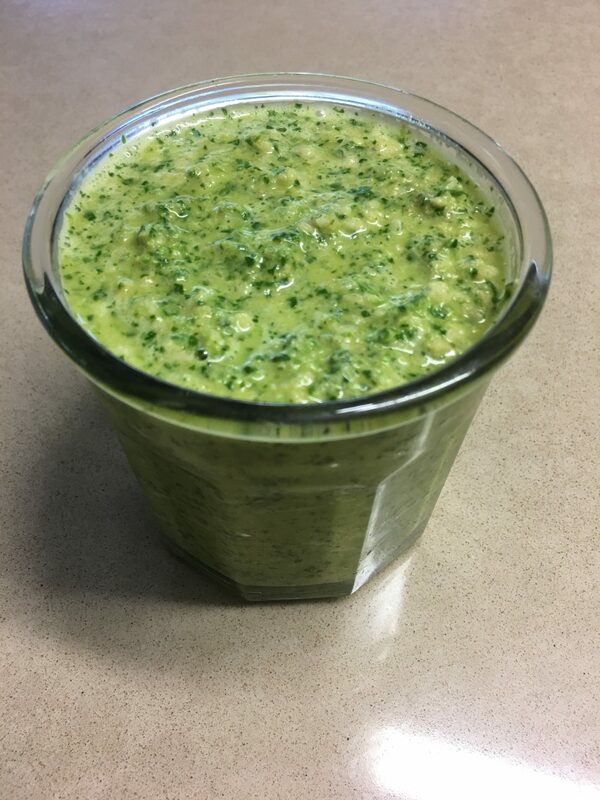 I find a food processor much easier than an old-fashioned blender where the ingredients tend to get stuck down the bottom and there’s far more risk of curdling. Adding extra vinegar at the end allows you to adjust the mayonnaise and give it a bit more tang. Using 100% olive oil results in a mayonnaise which is too rich for my taste and is much more likely to split. However, replacing a small amount of the canola oil with olive oil works well and gives a richer flavour. An Australian tablespoon is 20mls compared with an American tablespoon which is only 15mls. Refer to this page for more details on weights and measurements. Place eggs, vinegar, salt, sugar and mustard in a food processor and process for a good minute to thoroughly mix and warm the ingredients. Gradually add the oil through the chute with the motor running. Towards the end the mayonnaise will thicken up nicely. Add extra vinegar or lemon juice. Store in wide-mouthed jars with lids in the fridge. Keeps for up to 3 weeks. Mix together and refrigerate before serving. Adding Cognac gives the sauce a different taste for a change. Mix all together and serve with fish.